I have been a devotee since 1967, and joined ISKCON in Miami in 1971. In 1974 I served as a proofreader for Srila Prabhupada’s Caitanya-caritamrta, Madhya-lila Vol. 6, 7 & 8, and as comprehension editor on Antya-lila, Vols. 2 & 3. From 1980 to 2000 I worked as a technical editorial consultant in the IT field, writing and publishing many articles, books and websites on technical subjects. I also published many temple newsletters and fund-raising pieces at ISKCON temples from Bombay to Chicago. More recently I published my own books on spiritual subjects: Here Be Wisdom, Sri Visnusahasranama, Sri Nrsimhasahasranama, The Book of Gethsemane, and Search for the Absolute Truth. At present I am editing some of Srila Narayana Maharaja’s translations of the books of the Six Gosvamis. So I do have some acquaintance with literary work. The original edition of Srila Prabhupada’s Bhagavad-gita As It Is convinced many people, myself included, that ISKCON was a serious, spiritually-empowered movement with a philosophy that is at once ecstatic and profound. During the time that Jayadvaita’s edition of the Gita has been distributed around the world, we have seen a dramatic deflation of everything Srila Prabhupada worked for and achieved. I think this is sufficient evidence to convince any clear-thinking person that the general trend in ISKCON, of which Jayadvaita’s Gita happens to be a prime example, has been against the thrust of Srila Prabhupada’s original intention. karile jadapratistharupa visaya-taranga prabala haite pare na. NB: Srila Bhaktisiddhanta doesn’t state not to accept disciples, but the opposite: to give up the mentality by which one prefers not to accept disciples. Got ot (see attached file), which confirmed BVK Swami 100%. Could you please explain why this has to be changed? Madhudvisa prabhu, this change is now implemented in the Vedabase, and most probably in the new editions of Caitanya-caritamrta. This shows that the Caitanya-caritamrta, as it has stood for 35 years, states that “become guru” refers only to siksa gurus, and ISKCON’s leadership has recognized this, hence their desire to change it. I personally condemn this change, because the real purport is in the line with the context, and the later change is out of context, and made just to justify the personal motivation following the current ISKCON GBC guru system. Prabhu, would you please give your good opinion and advice on this issue? Actually my opinion on anything is of no value. However I can tell you that Srila Prabhupada has absolutely prohibited the BBT from making changes to his books and this prohibition of not changing absolutely anything at all in the Caitanya-caritamrta he made so strongly and so many times that any change to Prabhupada’s books and especially to Sri Caitanya-caritamrta will make Srila Prabhupada furious. And making Prabhupada furious is not a very good thing. So the future of these ‘devotees’ who are knowingly disobeying Srila Prabhupada is very dark indeed. Actually none of these changes will stand. We will preserve and reprint the original books of Srila Prabhupada and it is those original books that will be passed down to the future generations of Vaisnavas and scholars. No one who has any intelligence at all is ever going to be interested in reading one of Srila Prabhupada’s books containing thousands of unauthorized changes by these fools. They do not get it. Yes. Actually there may be some apparent errors in Srila Prabhupada’s books and Prabhupada opens up the Srimad-Bhagavatam stating that he considers presenting this in a foreign language may be fraught with errors but still the message will be clear and the people will understand the message. As far as your statement that Caitanya-caritamrta says “become guru” only refers to siksha guru this is total rubbish Prabhu. You should actually read Caitanya-caritamrta and then you will know that Caitanya Mahaprabhu and of course Srila Prabhupada wants everyone to beocome a bona fide guru and initiate disciples and spread the Krishna consciousness movement to every town and village. But there are qualifications required for guru and those qualifications have to be met otherwise one can not become guru. So Prabhupada wants all his disciples to become qualified gurus but it is up to the disciples to become actually qualified. If they become qualified the order is there from Lord Caitanya and from Srila Prabhupada. But we see that this qualification is not that easy to attain. It requires actual surrender to Srila Prabhupada but the disciples do not want to surrender to Srila Prabhupada. This is a perfect example of that. Prabhupada so strongly forbids the BBT from making any changes to his books but they change them anyhow. So such persons who so blatantly and openly and willingly disobey the orders of Srila Prabhupada will never, never, never be able to become qualified gurus. You can not base your whole philosophy on one line out of one of Srila Prabhupada’s books Prabhu that you happen to like. The process is submissive aural reception. Which means we have to hear and accept from Prabhupada everything he says about everything. Not that we put special stress on one line that supports our personal philosophy and put less stress on other lines that do not support our personal philosophy. We should have no personal philosophy that we are trying to support by selectively quoting from Srila Prabhupada. But both ISKCON and the ritviks have already formed their philosophies before reading Prabhupada’s books and have already decided what they believe and simply look for quotes that support their ideas and ignore quotes that go against their ideas. So both ISKCON and the ritviks are very dishonest when it comes to preaching about the guru issue. But also there is common sense. If you could actually find anyone with common sense. Simple spelling and real actual grammar and Sanskrit errors can be corrected. And errors that Prabhupada has ordered us to correct, like for example “cattle raising” is supposed to be “cow protection” in the eighteenth chapter of Bhagavad-gita, must be corrected. To not correct these errors would also be disobeying the orders of Srila Prabhupada. Thank you, Prabhu, for your answer. If someone wants to change the author’s writings, he should not use the name of the author as the author of those new writings. Isn’t it?! If I say something, and someone says something else which I didn’t say, he can not claim that I have said that. Or I will be disturbed, very disturbed. As you have said, Srila Prabhupada must be very disturbed and displeased because of the unauthorized changes of his books. Disobeying the order of a Guru is the first offense in chanting of the Holy Name. How can those offenders even initiate new people in the chanting of the Holy Name? What kind of initiation is that? I cannot grasp all these absurdities which are spreading out like an epidemic in the name of Hare Krishna movement. They must be checked, Prabhu. They should be exposed to the general people, as much as possible. But the real thing should follow. If ISKCON gurus and Ritviks are both corrupted, then how will Srila Prabhupada’s movement continue? Neither side will try to reform themselves. Each one will just blame another one. They will progress in a way just as in the early Christianity, and then they will fight, kill and exploit others, divide more etc. Those with the most power will rule over others. This is how I see the future of ISKCON. Srila Prabhupada’s original movement is already destroyed. It doesn’t exist any more. And without his movement, how the people will apply the knowledge in his books? If books are changed, then it seems easy? But if some of us continue to distribute his original books, there will be difficulties for new people to become Hare Krishnas. They may understand, but to apply this knowledge in practice, it will be difficult, or impossible. 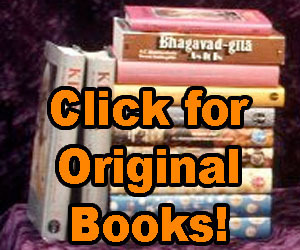 Everyone will ask, Where is the ISKCON mentioned in these books? I hope there will be some positive arrangements in this regard by the will of the Providence. Yes. We are in very dark times Prabhu. There is an English saying: “It is always darkest before the storm.” So there will be a very big storm and this bogus ISKCON will be destroyed in that storm and it will be up to the actual sincere followers of Srila Prabhupada to reestablish Srila Prabhupada’s ISKCON. It requires the leadership of an actual pure devotee really. So as Srila Prabhupada became a pure devotee of Krishna, well actually Srila Prabhupada is nitya-siddha, he was born as a pure devotee of Krishna, but anyhow there was a big storm in the Gaudiya Math also and that was destroyed by their guru apaharada. And Srila Prabhupada reestablished the real mission of Srila Bhaktsiddhanta in the form of ISKCON. Which went on very successfully in his physical presence because he was there to guide it and to correct all the deviations and just the physical presence of Srila Prabhupada, a pure devotee of Krishna. Prabhupada said that ISKCON was only going on because he was constantly traveling all over the world to visit all his centers and disciples and in that way everyone was getting the energy to push on. So in reality this physically present pure devotee is actually essential to have any real world-wide preaching mission. Putana is the slayer of all infants. The baby, when he or she comes out of the mother’s womb, falls at once into the hands of the pseudo-teachers of religion. These teachers are successful in forestalling the attempts of the good preceptor whose help is never sought by the atheists of this world at the baptisms of their babies. This is ensured by the arrangements of all established churches of the world. They have been successful only in supplying watchful Putanas for effecting the spiritual destruction of persons from the moment of their birth with the cooperation of their worldly parents. No human contrivance can prevent these Putanas from obtaining possession of the pulpits. This is due to the general prevalence of atheistic disposition in the people of this world. But Putana does not at all like to receive her reward in only form which involves the total destruction of her wrong personality. King Kamsa also does not like to lose the services of the most trusted of his agents. The effective silencing of the whole race of pseudo-teachers of religion is the first clear indication of the appearance of the Absolute on the mundane plane. The bona-fide teacher of the Absolute, heralds the Advent of Krsna by his uncompromising campaign against the pseudo-teachers of religion. So you can see that Putana and her demonic friends can play their evil unlimitedly only until Krishna appears, then they are vanquished. The same Putana demons were running wild before Srila Bhaktsiddhanta Sarasvati Thakura started his preaching, but with his appearance all the Putanas were silenced. And as soon as Bhaktsiddhanta disappeared the Putanas were all back again in full force, that is until Srila Prabhupada started his preaching, then all the Putanas were silenced again. But when Prabhupada disappeared the Putanas again attacked and again gained strength and now have completely taken over both ISKCON and the ritviks also. So it is just one batch of Putanas fighting with another batch of Putanas. Both quoting Prabhupada and both using “Prabhupada said” in every second sentence they speak. Both are attracted by the fame, oppulence, power, position, strength, beauty, intelligence, determination, energy, enthusiasm, etc, of Srila Prabhupada, and Prabhupada is of course a transparent via-medium to Krishna. So what we are seeing in Prabhupada is Krishna. So they are attached to Krishna, but it is in a perverted way. They want to become Prabhupada, they want to become Krishna. So rather than wanting to surrender and serve humbly, they want to be the master. This is the material disease. This is maya. The idea that we can become the lord and master. Actually we can never become the lord and master. We are eternally servants of Krishna. So the only solution to this problem is that at least one or hopefully many of Srila Prabhupada’s disciples really surrender to Srila Prabhupada and actually become pure devotees of Krishna. They will then be empowered to fix this mess. As soon as a pure devotee of Krishna starts preaching again then the Putanas will loose all their energy and power and they will be finished and the real mission of Srila Prabhupada, Bhaktsiddhanta and the whole param-para back to Lord Caitanya will again start to flood the world with love of God. There has to be a leader and the leader has to be a pure devotee of Krishna. And if he is a pure devotee of Krishna surrendered to Srila Prabhupada he has the order from Lord Caitanya and from Srila Prabhupada to preach and initiate disciples and actually one such pure devotee of Krishna can spread Krishna consciousness all over the universe. But without a living pure devotee of Krishna like this a world-wide preaching mission can not be managed and pushed on. Srila Prabhupada is living in his books and individually we can take advantage of Srila Prabhupada’s association in this way. And individually if we read Prabhupada’s books and surrender to him and follow his instructions we can become pure devotees of Krishna. But to manage any sort of preaching on a large scale a living pure devotee leader or acharya is required. Otherwise it is not possible to spread Krishna consciousness all over the world. So if Prabhupada’s movement is to succeed, and it will succeed, at least one and hopefully many of Srila Prabhupada’s disciples have to actually surrender to Srila Prabhupada and make Prabhupada’s mission their mission in life and become pure devotees of Krishna and become guru and preach….